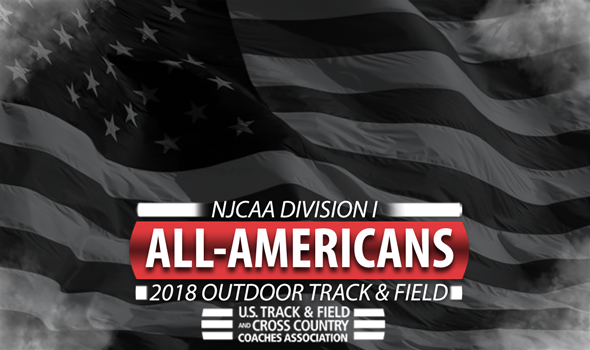 NEW ORLEANS – All-America honors for the 2018 NJCAA Division I Outdoor Track & Field season were announced Monday by the U.S. Track & Field and Cross Country Coaches Association (USTFCCCA). Student-athletes earned USTFCCCA All-America status by virtue of finishing among the top-8 in their events – including as a member of a relay team – at the NJCAA Division I Outdoor Track & Field National Championships that were held in El Dorado, Kansas, last weekend. A total of 188 men claimed 247 All-America honors from 34 different institutions. NJCAA Division I champions Barton County (Kan.) CC led the way with 34 All-America honors, while runner-up South Plains (Texas) was second with 29. A total of three athletes from Cloud County (Kan.) CC in Moses Dirane, Stephen Marindich and Thobile Mosito garnered three All-America honors each. Hinds (Miss.) CC had two men with three All-America honors in Khance Meyers and Marquel Pittman, while Markim Felix and Felix Kosgei of South Plains (Texas) also picked up three. On the women’s side, 161 different women earned 242 All-American honors from 33 different institutions. National champion New Mexico JC owned a nation-high 30 honors, followed by Iowa Central CC and Central Arizona, which each had 22. A total of five women earned four All-America honors. The Thunderbirds’ Esther Gitahi and Teresha Jacobs picked up five each, as did Iowa Central CC’s Adva Cohen and a pair of women from Central Arizona in Josephine Anokye and Nicolee Foster. Below is a full list of All-Americans.